Visible gold over a 5-metre interval (129 – 134 m). Contained within a 7-metre interval (129 – 136 m) of gold-silver-copper mineralization with a length*** weighted grade of 15.0 grams/tonne (g/t) gold (see below). Including a 1-metre interval (129 – 130 m), re-assayed three times, grading between 45.0 and 81.3 g/t gold. The drill hole was collared in the immediate catchment of a renowned placer creek (Revenue Creek), and the mineral association, coarse gold with bismuthinite, is the same as the placer gold. the Guder Zone, which is approximately 400 metres past the confluence, up the ridge to the south. Historical assay results for the two zones are noted below and in Table 3. RVD17-14, the first modern drill hole in the area, was collared in the Guder Zone, 200 metres away from any historical trenching or drilling, within an outstanding and previously untested portion of the gold-in-soil anomaly, which includes four high grade samples (3.37 g/t, 2.26 g/t, 0.83 g/t and 0.88 g/t). The drill hole intersected a seven-metre-long interval (129 – 134 m) of strong gold-silver-copper mineralization with gold disseminated within intergrown pyrite-arsenopyrite-chalcopyrite-bismuthinite and carbonate veins. The interval includes a 5-metre section with visible gold. The tenor of gold mineralization in RVD17-14 is high as confirmed by repeated assay results, however, the results indicate a pronounced nugget effect. To reduce the nugget effect Table 2 includes the averaged results from repeat fire assays (with gravimetric finishes for Au>10 g/t) See the bottom of the news release for a table of all gold results from the high-grade interval. high-grade gold in drill intersections from the Guder Zone (Table 3). 29.79 metres (185.00 – 214.79m) of 0.46 g/t AuEq* in rocks with polyphase porphyry veining and potassic alteration at the contact between granite country rock and the Revenue diatreme. 6 metres (331.00 – 337.00 m) of 0.73 g/t AuEq* in sulfide-matrix hydrothermal breccia within the Revenue diatreme. The 29.79 metres of porphyry mineralization on the margin of the diatreme add to the body of evidence (see PR17-12, PR17-13) that show a broad, at least 2.85 km long, mineralized porphyry at Revenue, which is cored, and cross-cut, by the Revenue diatreme. * Copper and Gold Equivalent [CuEq, AuEq] are used for illustrative purposes, to express the combined value of copper, gold, silver and molybdenum as a percentage of either copper or gold. No allowances have been made for recovery losses that would occur in a mining scenario. CuEq and AuEq are calculated on the basis of US$3.10 per pound of copper, US$1,305 per troy ounce of gold, US$17.40 per troy ounce of silver and US$7.00 per pound of molybdenum oxide. Each of the five high-grade gold samples reported from RVD17-14 (129-136 m) underwent two sets of fire assay (Table 5) analyses and an additional metallic screen analysis (Table 5). Note: The average of tests 1 and 2 are calculated by first averaging test 1 FA1 and FA2, and then averaging that result with test 2. 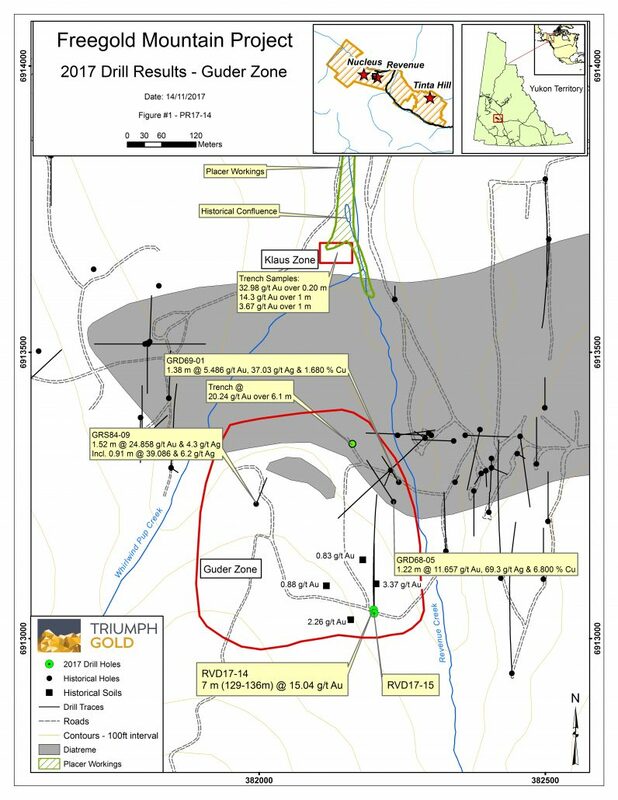 Drill core samples ranged between 1 and 2 meters length and were cut at Triumph’s core logging facility on the Freegold Mountain Property. The samples were analyzed by ALS Global of North Vancouver, British Columbia. They were prepared for analysis according to ALS method PREP35: each sample was crushed to 70% passing 2mm and a 250g split was pulverized to better than 95% passing 106 micron mesh. Gold was tested by fire assay with atomic absorption finish on a 30g nominal sample (method Au-AA23), and samples that tested over 10 g/t Au were retested using fire assay with a gravimetric finish (method Au-GRA21). An additional 35 elements were tested by ICP-AES using an Aqua Regia digestion (method ME-ICP41), over limit samples for copper were retested using the same technique but with assay grade Aqua Regia digestion and a higher range of detection (method ME-OG46). Quality assurance and control (QAQC) is maintained at the lab through rigorous use of internal standards, blanks and duplicates. An additional QAQC program was administered by Triumph Gold: at minimum one in ten samples submitted by Triumph Gold was a blank or certified reference standard. QAQC samples that returned unacceptable values triggered investigations into the results and reanalyses of the samples that were tested in the batch with the failed QAQC sample. Where contamination or analytical error were suspected the original data were discarded and superseded by the results of the reanalyses. The five samples reported in Table 5 were part of a 19-sample batch that included six QAQC samples. The samples were delivered by Triumph Gold personnel directly to the ALS prep-lab in Whitehorse. All of the samples were tested by the methods discussed in the previous paragraph and the five samples listed in Table 5 were also tested using the gold screen metallic technique (method Au-SCR24). For this technique the sample was prepared by passing up to 1000g of pulp though a 100 micron mesh and testing both the material that passed through the screen (“-“ fraction) and the material that remained on the screen (“+” fraction). The entire + fraction was tested by fire assay with a gravimetric finish, and the – fraction was homogenized and two 50g splits were tested by fire assay with AAS finish and the results were averaged. The gold values of the + and – fractions were combined in a weighted average to give the total gold content of the sample. Some technical information contained in this release is historical in nature and has been compiled from sources believed to be accurate. This technical information has not been verified by Triumph Gold and may in some instances be unverifiable. Main, C.A., Duke, J.L., (1988): Revenue Trenching and Geophysics. Assessment Report # 092131, Yukon Department of Energy, Mines and Resources.